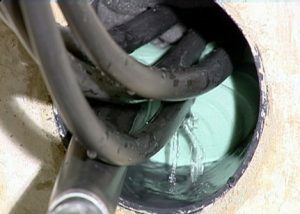 Stopaq® 2100 Aquastop is a compound suited for sealing of pipe- or cable wall inlets and hollow spaces against penetration of gases, moisture, standing water and running ground water leaks. It is a non-toxic, single component, elastic, water- and gas tight synthetic compound. It adheres on dry and wet surfaces of concrete, brick, PVC and others. There is no need for primer application, and it does not cure but remains permanently flexible. The compound does not build up internal stresses and expands when exposed to water. Stopaq® 2100 Aquastop compound must be covered with a barrier of water resistant- or fire retarding mortar.